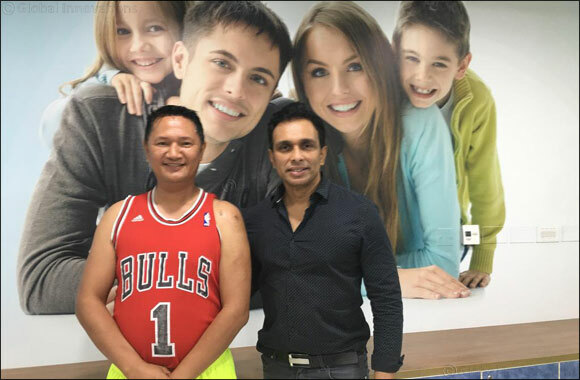 Dubai, United Arab Emirates, 30 December 2018 – 42-year-old John Dingo Demadura Rojas, a resident of Dubai was biking in a mountainous area when he had an accidental fall and injured his left clavicle. In severe pain John was rushed to another hospital where he was advised to undergo an open surgery to restore the shoulder function. However, he approached Zulekha Hospital Sharjah for a second opinion and was keen on an alternative to the open procedure. The diagnosis revealed a grade 3 (complete) dislocation of the lateral end of the clavicle – left shoulder. It was observed that the joint between the clavicle and shoulder blade had disrupted owing to complete disruption of ligaments. This resulted in dislocation of one end of the collar bone. His shoulder movements were painfully restricted in all the planes and there was a palpable deformity over the superior aspect of the shoulder from the dislocated collar bone. After a thorough assessment, considering John's desire to restore his shoulder functions through a key hole surgery, Dr. Biju Pankappilly, Specialist Orthopedic Surgeon advised an arthroscopic assisted reduction of the joint with suspensory devices, along with a semitendinosus autograft augmentation for superior results. This is a biological augmentation for added stability and speeds-up the healing process. During the arthroscopic surgery, small key holes were made around the shoulder through which an arthroscope was introduced into the shoulder joint to look for any additional intra articular pathologies inside the shoulder which are very common following a fall on the shoulder. Intraarticular injuries can be been easily missed if one resorts to an open surgery alone. The patient had a very small partial thickness rotator cuff tear which needed only debridement. Dissections had to be made around the Neuro vascular structures to aid in passing the tendon autograft through the key holes with specialised instruments – this was the most difficult part of the surgery. A small 1.5 cm incision was made over the collar bone for the purpose of drilling and a suspensory device with suture tapes and titanium buttons on both the ends were inserted to hold the acromio clavicular joint in reduced position. Semi tendinosis tendon graft taken from his leg further supported the fixation. “The suspensory device plays a vital role in holding the reduced joint in position until the ligaments heal and the biological augmentation will make the construct much stronger speeding up the recovery. In an acute situation, one can opt not to have the tendon augmentation. However, in John's case it was more than two weeks since his injury happened, which meant that the ligaments would have already started healing in an elongated position. This is why we decided to augment the reconstruction with a tendon graft,” he concluded. The patient's post operation X-ray shows excellent reduction of the dislocated acromioclavicular joint. John started his home physio sessions the day after the surgery and as time progresses he will be put on more aggressive regimes. If all goes well, John should be able to resume his biking activities in 3-4 months' time.